First shows you a modern 2004-2013 Seat Altea head unit after installation from Seicane. 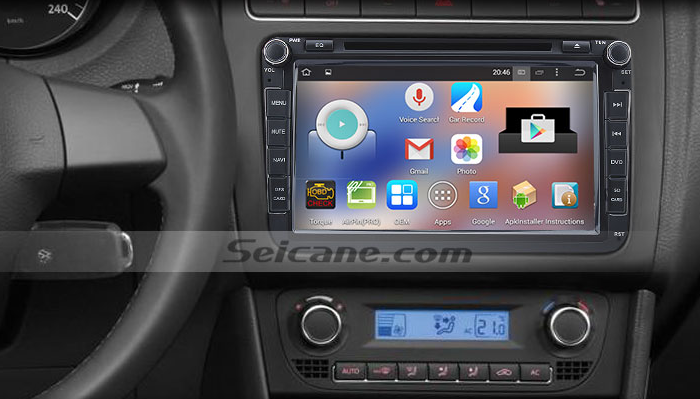 To install such a multifunctional car stereo can bring you a lot of convenience and pleasure in your car, and it’s quite easy to install it. With a detailed installation guide, you can also finish it at your home. If you have the same dashboard as the picture above, you can take this …. Installation guide as a reference as well. That’s all the installation guide for a 2004-2013 Seat Altea head unit. If you have any questions, you can seek help from your dealer or a professional. If you find it too hard for you to understand all the steps, you’ d better have it installed by a professional. This Seat Altea head unit is built in the latest GPS software to lead you to get to the desired destination with the least time under the guidance of turn-by-turn direction and voice prompts. You can wirelessly connect your mobile phone which has Bluetooth function with this unit to have hands-free calls for a safe driving and stream music to relax yourself and your passengers. Other multimedia formats like DVD/VCD/CD/MP3/MPEG4/DIVX/CD-R/WMA/JPEG are also supported for you to have fun on all trips. With great performance, this hot-selling Seat Altea head unit is just the best replacement for you to replace your factory radio. Just take it and go! Good luck to you!